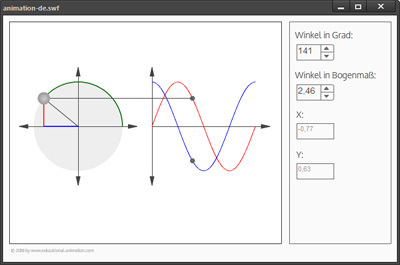 The animation shows the geometric relationships of the sine and cosine theorem. The red dot can be adjusted with the mouse. To change the shape of the triangle, simply move the red dot. The markers on the two curves are adjusted automatically. The animation shows a right-angled triangle. The adjacent leg of the angle alpha is marked in blue, the opposite leg is red. Like the adjacent leg, the cosine curve is in blue, the sinusoid curve is red. Like the adjacent leg, the cosine curve is also represented by blue. The sinusoid curve is red. The bent arc length of the angle is green. The animation shows that the height of the opposing cathetus (leg) in the unit circle is identical to the sine value. The length of the adjacent leg is accordingly identical to the cosine value. The relationship between sinus curve and length of the ankathete (adjacent side) is also illustrated by a guide line. Because of the perspective, it is only possible to show the sinusoidal curve but not with the cosine curve. Clicking inside the large rectangle will generate the formulas. The lengths of the adjacent side (X) and the opposite side (Y) are also displayed as exact values in the input fields. These values cannot be changed via the input fields. Instead, only the angle alpha can be changed. To set an angle, you can employ the two rotary fields (degrees and radian measures) in the upper right side.